Professional breweries cool the contents of the fermenter gradually to 35° to 40° F, which forces most of the yeast to flocculate. Most home brewers do not have the facilities to do this, so they must wait for the fermenter to clear. It no longer takes the resources of a professional brewer or the knowledge of an electrical engineer to take control of your fermentation schedule. With current technology, home brewers can now take control of the brewing process like a pro. Using a thermostat power control unit plugged into a freezer, or a kegerator with a digital read out and adjustable thermostat, you can take control of your fermentation schedule to produce clean ales, lagers or even complex beers with dynamic fermentation schedules. A thermostat power control unit overrides an appliance’s thermostat, regulating the amount of energy getting to the appliance and allowing you precise control over the temperature settings and the amount of temperature fluctuation between cooling cycles. 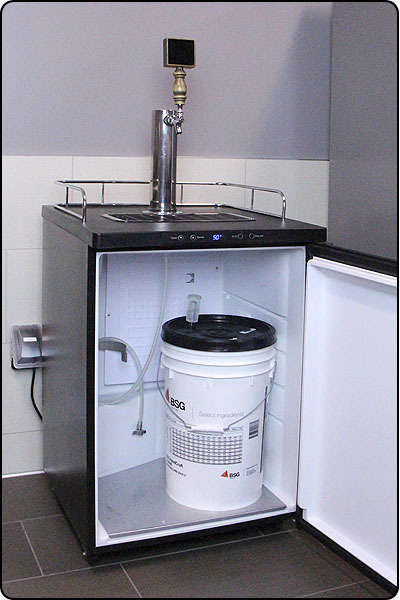 The same concept can be used in affordable kegerators such as Kegco’s K309 models. With a digital thermometer and push-button controls, the days of guessing what temperature you will get by setting a dial to 5 are over. 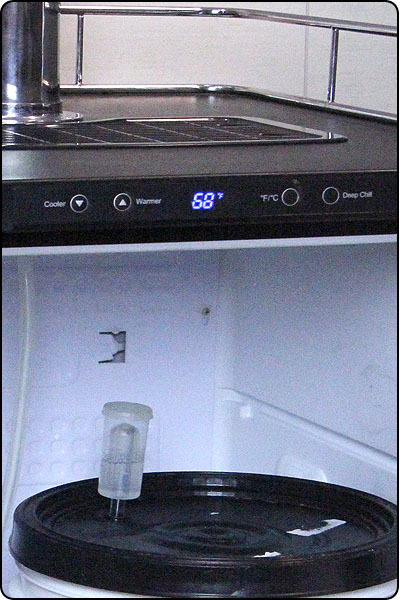 To give an example of how I use this technology, I recently put a five-gallon batch in a Kegco K309 kegerator for the duration of the fermentation schedule. It was a stout recipe that I have brewed a few times previously with great results. Living in San Diego, I don’t have to deal with extreme temperature variations, but this past January I lost 15 gallons of pale ale due to unseasonably warm spells. I had 3 buckets that were 2 days into fermentation when they saw temperatures in the high 80’s. By the time I saw the thermometer, it was 81° F. When the beer finished, it was full of unwanted esters which gave it Belgian taste. My expectations for this batch were very high because instead of throwing a bucket/carboy in the corner, I was able to control the fermentation temperature accurately through the entire process with a kegerator. We pitched WL001 at a precisely measured 75° F and then quickly brought the temperature down to 68° F, where it stayed for 10 days. I then raised the temperature to 74° F for diacetyl rest before bringing it down to 50° F for two days. I dropped it down to 35° F for a final crash before racking it into a secondary at 35° F for a couple days until I could keg and carbonate. The finished product did not disappoint, as it was 7.7% ABV, malty and delicious. I can’t say it was noticeably better than previous batches, but it was definitely a clean stout and eliminating the chance of getting off tastes from unpredictable fermenting temps allowed me to rest easy throughout the process. Controlling your fermentation ensures a more consistent final product and you eliminate the chance of losing a batch to unpredictable weather. It gives you one more variable to control in your homebrew process and it is a very simple to do with the right tools. Home Brewing Fermenting, Kegerator. permalink. What Is The Difference Between Long Term And Short Term Wine Storage? Thanks for the information on fermenting beer in a kegerator. I reciently purchased a Kego HK-38-BS kegerator from you. Very pleased with the unit. My only dissapointment was the fact there was to hole in the unit to connect a gas line with an outside CO2 tank. A thermostat control unit’s wired temp probe would suffer from the same issue. I have talked with several support staff from Beverage Factor and Kegco about how and where I could safely drill such a hole in my kegerator wall but no one would give me a solution to this issue, citing liability issues. Can you help ? The 4” x 6” area in the top right-hand corner of the inside back of the unit is safe to drill. The hole size to drill is 9/16 for a standard Kegco gas line.